Remember that series of HTC One E9+ renders we showed you on Saturday? They are now posted on HTC's Chinese website which makes them official. HTC is expected to introduce the HTC One E9+, the HTC One E9 and perhaps some other models at its "More than One" event on April 8th. While none of the new E-series phones are expected to touch down in the U.S., there is hope that we could finally see the long rumored HTC One M9+ announced during the event. While our Chinese isn't what it used to be, we can tell you that the HTC One E9+ will indeed sport a 5.5-inch screen with resolution of 1440 x 2560. This works out to a pixel density of 534ppi. Under the hood you will find an octa-core 2GHz MediaTek MT6795 CPU. 3GB of RAM is inside along with 16GB of native storage. Those requiring additional memory can turn to the 128GB capacity microSD slot. A 20MP camera will be on back with a 4MP Ultrapixel camera. A 2800mAh battery will power the device, which will be offered in Classic Rose Gold, Gold Sepia and Meteor Gray. The Dolby-enhanced BoomSound speakers are found on the top and bottom of the plastic-encased unit. The handset features 4G LTE connectivity and Dual nano SIM slots. We should point out a major discrepancy in the specs. 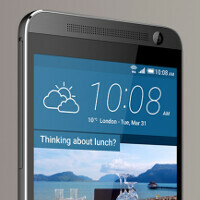 HTC mistakenly lists the resolution of the screen as being 1080 x 1920 with a pixel density of 534ppi. The latter figure would be correct only if the resolution of the display is 1440 x 2560. It seems that some of the specs listed on the site are for the non-Plus version of the device, causing some confusion. While we did show you the renders of the HTC One E9+ on Saturday, the improved quality of the images from the official HTC site makes it worthwhile for us to show them to you again. Just click on the slideshow below! Thanks for the tip, Sadra! No snapdragon 810 version? I wonder if the MediaTek chip has a quick charging / turbo charging or any high speed charging technology? No way , MediaTek is still catching up to Samsung and other major players. What i expect from this chip is medium performance at best. I wasn't expecting the speed to be great. What I want to know is if this phone that can be charge very fast so I don't need to be wall hugger (if I decide to buy it). IMO It looks better than M9. Put in a snapdragon 805 and a different camera then I'll consider buying this. Better than m9 Imo. The size is right. M9 is too small. Ugliness have no limits in this phone !